Dextran is primarily produced from sucrose by the bacterial species Leuconostoc mesenteroides, which secretes an extracellular enzyme called dextransucrase. Dextran formation in sugarcane mixed juice during processing reduces profits by causing sucrose losses and degrading sugar quality. 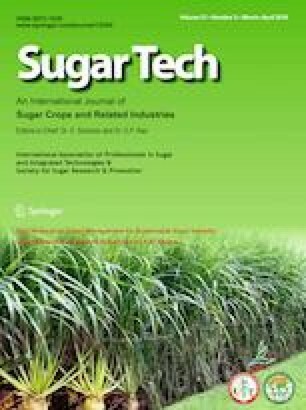 The results of this study showed that sucrose conversion rate in sugarcane mixed juice increased from 13.25 to 90.77%, and that dextran content increased from 3.58 to 66.07 mg/mL as fermentation time was extended from 6 to 84 h. Moreover, neutral electrolyzed water inhibited the growth of L. mesenteroides. Inhibition zone diameters gradually increased as NaCl concentrations increased from 0.10 to 6.4%. This result may be attributed to increments in free available chlorine concentrations with increasing NaCl content. The peak areas of sucrose, glucose, and fructose in the chromatograms of sugarcane mixed juice treated with neutral electrolyzed water remained unchanged, and the absence of dextran formation during 84 h of fermentation suggested that neutral electrolyzed water could reduce dextran synthesis and minimize sugar losses. The results of this study indicate that neutral electrolyzed water has important applications as an effective bacteriostatic to resolve the problem of L. mesenteroides contamination in sugar industry. Shuang-Xia Huang and Dian-Zhi Hou have contributed equally to this work. This work was financially supported by National Natural Science Foundation of China (21768001) and Collaborative Innovation Center for Guangxi Sugar Industry.